Most flights terminate to Dar-es-salaam, before travelling on a smaller internal flights across the water to Zanzibar. We do organise port/Airport pick up or from anywhere in Zanzibar town. 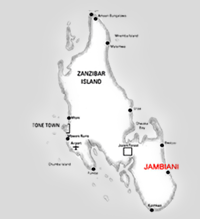 If you have already spent a night or two in Zanzibar twon, You can ask the hotel staff at your hotel. They should be able to arrange a transport for you to our place.